← Is it Time to Replace Your Firing Pin Spring? 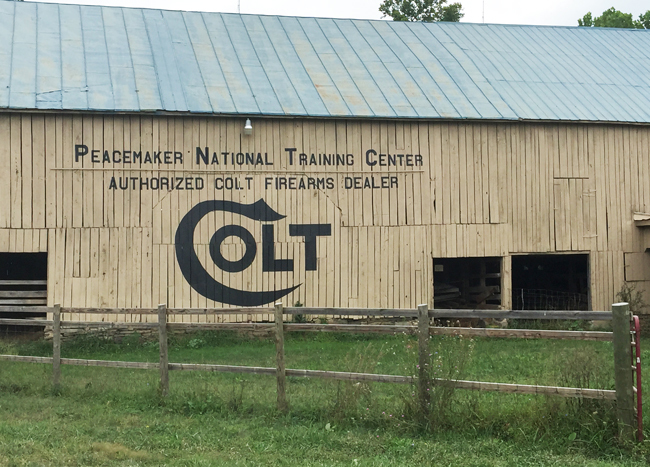 The FNH-USA 3 Gun Championship was held at the Peacemaker National Training Center in Glengary WV last week, September 3-5. About a week out, I was prepping my usual Heavy Metal Iron Sight gear for the match when I received an email from match staff advising me that they would not be recognizing my division this year. What an opportunity to try out my new Burris XTR II 1.5 x 8 scope that I received just a couple of weeks earlier. Welcome to Heavy Metal Optics Division. The division change meant that I could put away my pump shotgun and use my VersaMax semi-auto but it would be limited to a 9 round capacity. I’d still be using my 10 round .45 Caspian wide body. The big change would be taking the iron sights off my DPMS G2 .308 rifle and sighting in with my Burris XTR II. This would be the first time shooting my .308 with a scope so I would need to to a lot of homework to work out my holds with my ammo. It wasn’t long before everything was running smoothly and the match was upon me. The 3 day match seemed to speed by with 10 stages clicking by quickly. While shooting the stages, I didn’t feel as though I was burning anything down, I was just keeping up with the OPEN and Tac Optics shooters on my squad. I struck a plastic barrel on a small stage on day 1 with a pistol round giving me a penalty but other than that, things just went smoothly. The next thing I know it’s the morning of Day 3 and people in the Heavy Metal Optics Division are coming to watch me shoot my last stages. After my final shots were fired, those HM spectators stepped up and told me I had just won my first Heavy Metal Optics Championship. Well, the 2015 FNH is in the dust (literally). This exciting match is put on by FNH under match director and long time 3 gunner, Larry Houck. Larry really knows how to put on an excellent match. He has enough range officers on each stage so you don’t have to set or paste targets. All you have to do is concentrate on shooting. A few of the stages were set up in bays, but many were in natural terrain. Shots ranged from fairly close paper to some 400 yard rifle shots. One stage, you shot rifle from a small shooting area in front of a boat, moved downhill and grabbed your shotgun and as soon as you touched your shotgun, the first clay pigeon was launched with 5 more on report, then you had a bunch of steel to engage. Another neat thing about this match was you had an option on which firearm you could use. Most steel targets could be shot with handgun or shotgun with shot. Slug targets could be shot with one slug or 2 pistol. Paper targets could be engaged with pistol or rifle. It made a very interesting match because everyone had a different idea on how they wanted to shoot it. Some shooters such as Monte Long often chose to shoot handgun in place of his shotgun. It made it where if you felt more comfortable with one firearm than another for reasons like being faster to load, they had a choice. This is some very beautiful country with leaves just starting to show a hint of changing colors. Another 3 weeks and the whole country side there would have been really colorful. Dust was a major problem though. 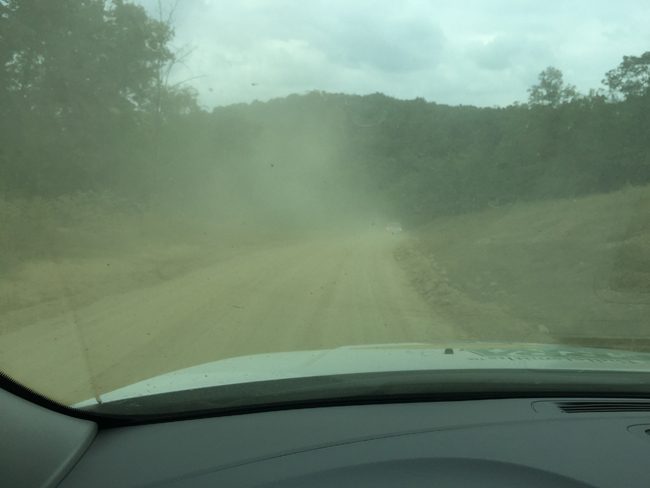 It was very dry down there and with that many vehicles on the road, the dust turned more like talcum powder. You would get a $20 speeding ticket (cash only and no change given back, so if all you had was a $50 or $100, the fine went up) for driving over 10 mph. The thing about it though, it was so dusty you couldn’t see to drive more than about 8 mph. All speeding fines plus fines for shooting targets with the wrong ammo (for instance birdshot plates with slugs) went to the Junior Camp where many of the top shooters in the country teach the kids the correct way to safely handle firearms and how the best way to shoot different stage scenarios. There are a lot of excellent junior shooters coming out of these camps. There was several hundred dollars raised for the Junior Camp especially from target fines. There was one RO that will probably try to claim about 3 kids on his taxes this year. I guess he was pretty persistent in shooting shot targets with slugs. Larry not only knows how to put on a good match but he knows how to feed you as well. His mom’s church group does the lunch at the range with a wide variety of delicious food. He should get them to cater the banquet, because the range food was excellent. I was on a great squad with some excellent shooters and a couple of my long time friends from Texas, Monte Long from XS Sights and James Darst. 260 shooters shot Tactical Optics Class with Daniel Horner (US Army) taking first and Greg Jordan (Armalite) taking second. In the Open Class, they had 41 shooters with Joel Turner taking first, Nick Kalishek taking second and my good friend Tony Holmes taking 4th. 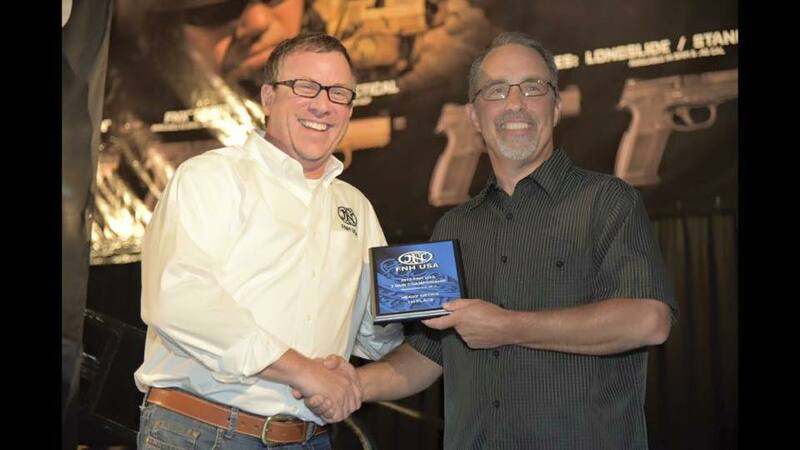 15 shooters were in Tactical Limited Class with Joel Turner and Rick Birdsall taking first and second. 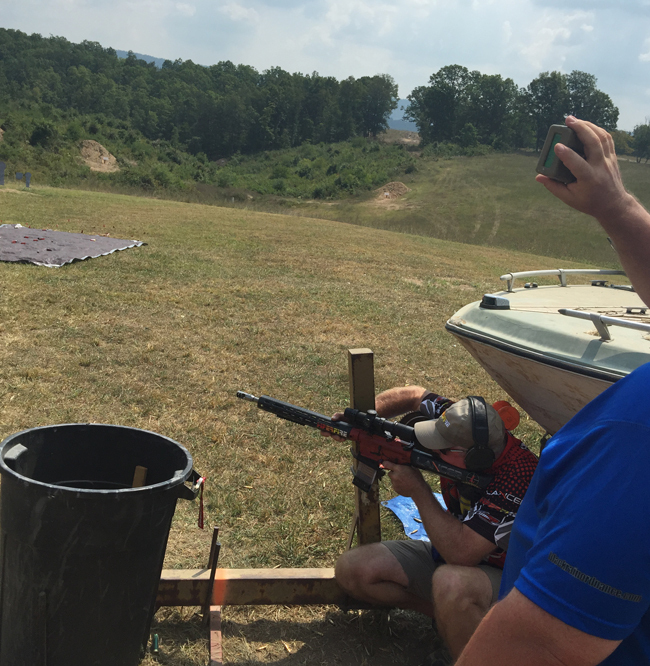 Only 12 shooters tackled the Heavy Metal Optics Class with Bruce Piatt and Dean Deturk taking first and second. That brought it to a total of 328 competitors. FNH had 3 side matches that you could shoot to try out their firearms (I love their O/U shotgun) and each side match you shot, they gave you a ticket. 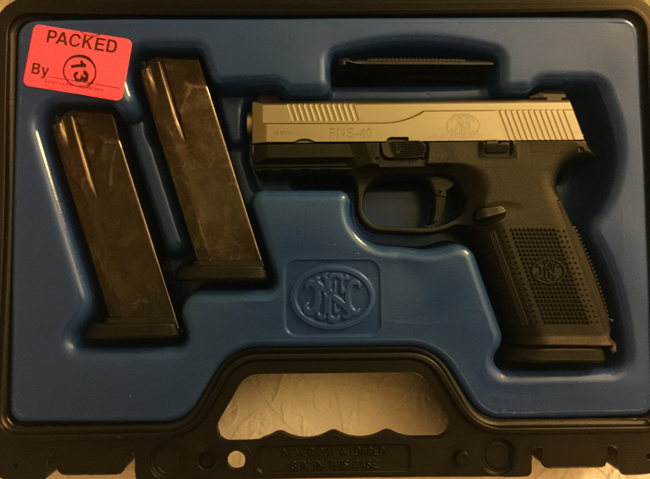 All those tickets were turned in at the banquet and the winner won a new FNS-40 pistol. I was really surprised when I happened to be that lucky person and I would like to thank FNH for that fine pistol. I have already shot it and it shoots great. Larry did an outstanding job on the prize table also. There was nearly $200,000 worth of merchandise on the prize table. If you are looking for a great 3 gun match to shoot, this is definitely one you will like. Well, I am off to the Generation III 3 Gun match, so see you on the range. 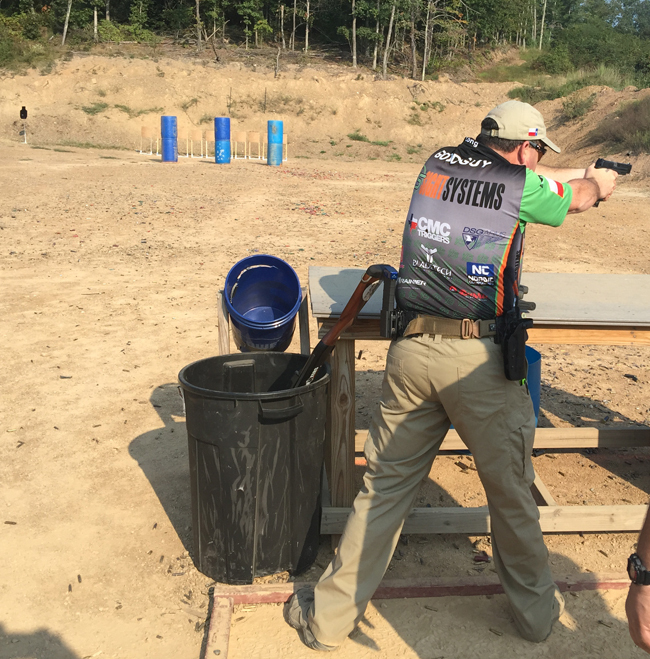 This entry was posted in Competitive Shooting and tagged 3-Gun, 3-Gun Championship, 3-gun competition, Bruce Piatt, Burris scope, FNH 3 Gun, Peacemaker National Training Center. Bookmark the permalink. Good cause with the penalty money!